A while back, I wrote a fairly honest post detailing my history with Syd, and his new project, Hotels and Highways. I had this amazing bromance with his music when I first heard it, but then somewhere along the way our paths diverged, and I was – to be honest – often frustrated with his newer stuff. The thing is, I have so much respect for the dude, that I was just really hoping on hope that his next album would be something I could get into again. So when I popped Lost River into my player, a smile spread right from ear to ear; because I knew that this was the album Syd and his compatriots, Patrick Thomas and Lisa Piccirillo, were meant to make. Finally. 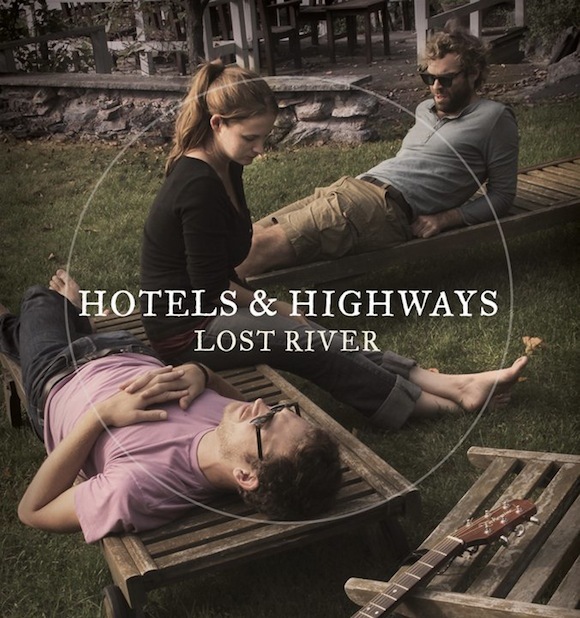 Right from the very first track (the foot-tap inducing “Train Whistle”), Lost River is an album that you can’t help but connect with. Syd, Patrick and Lisa bring so many different facets to it, I’d be amazed if there weren’t at least two tracks on here that you didn’t feel were written by someone just like you (except maybe smarter). I won’t let this become a track-by-track type review, because too many of these songs personally connect with me, and it would be a silly kind of review (in fact, in my view “Figueroa” is the only misstep of the 12 tracks on the album). Suffice to say though, that I really, really like this album. And it’s like your favourite band shirt that only becomes more comfortable with each wear… it’s that kind of album. I’ve embedded two tracks below, and if you like what you hear, then head on over to their bandcamp page where you can purchase the full thing. 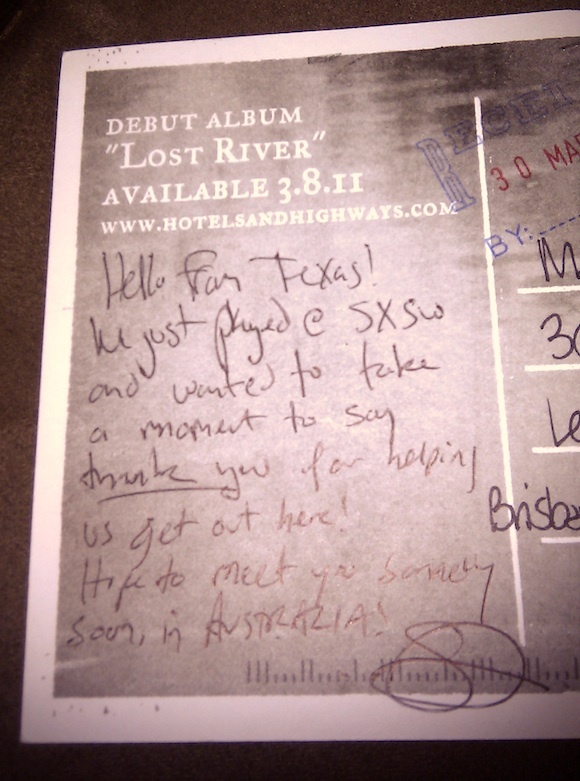 Also, just as a sign of how friggin’ cool these people are… while playing out at SxSW this year, dude took some time out to send a postcard, all the way to Australia, to say thanks. How many bands take the time these days to do something that awesome? Not many. So thanks, Syd, Patrick and Lisa… you put a smile on my face, and some tunes in my bones. Here’s to a long relationship ahead. The “Lost River” album came in the mail the other day, also got a signed postcard from I think Lisa in the package, that was such a sweet gesture – impressed me too.